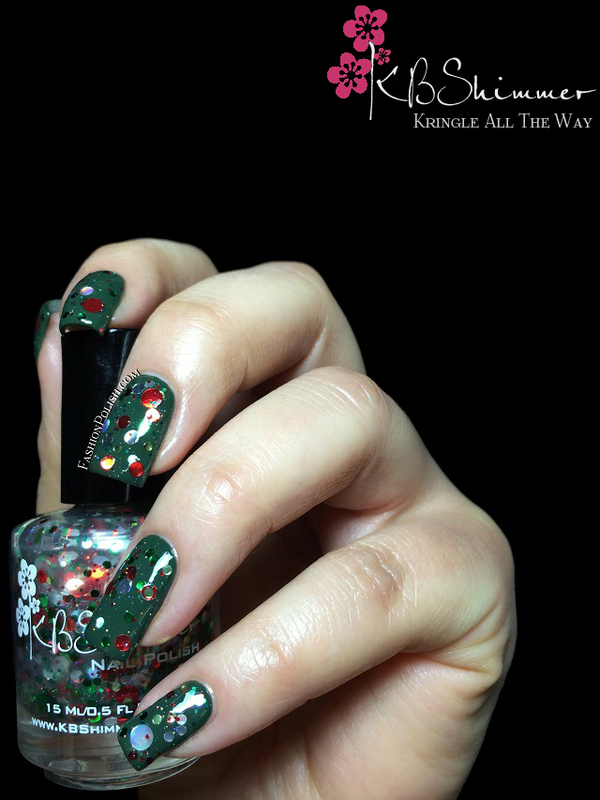 Fashion Polish: KBShimmer Winter Collection review! Hi guys, today I have the second half of the KBShimmer Winter collection to show you! I posted the first half in what seems like ages ago and haven't been able to swatch these earlier because my son someone broke my cherished duochrome set-up lamp *sigh* but I just couldn't not post them, right? "2013 Toys For Tots Charity Polish. A glitter top with circle glitters in red, green, and silver"
Excellent glitter pay-off and easy application. I used 1 coat over Zoya Hunter. LOVE the dot glitter overload and holographic pieces! Perfect! "A white creally with hex glitters and micro slices in red, green and sliver"
Completely opaque in 2 coats and just the perfect amount of glitter, no fishing necessary. KBShimmer definitely makes the best white creme glitters! "A deep indigo jelly base with violet and sky blue holographic glitters and sliver holographic snowflakes"
I feel like I'm repeating myself but application and glitter pay-off were, once again, really nice, although I did have to be careful with the snowflake pieces to get them to lay flat onto the nail. I used 2 careful coats and was happy with the result but I'd say it's a true 3 coater. "A warm gray creally filled with fuchsia circles, square and hex glitters. Turquoise, sapphire, and chrome hexes, micro slices and circles swim among micro holographic sparkles"
This one's my fave among the glitters, I love the colors together and the mix of small and larger pieces. Again, 2 easy coats are shown here. 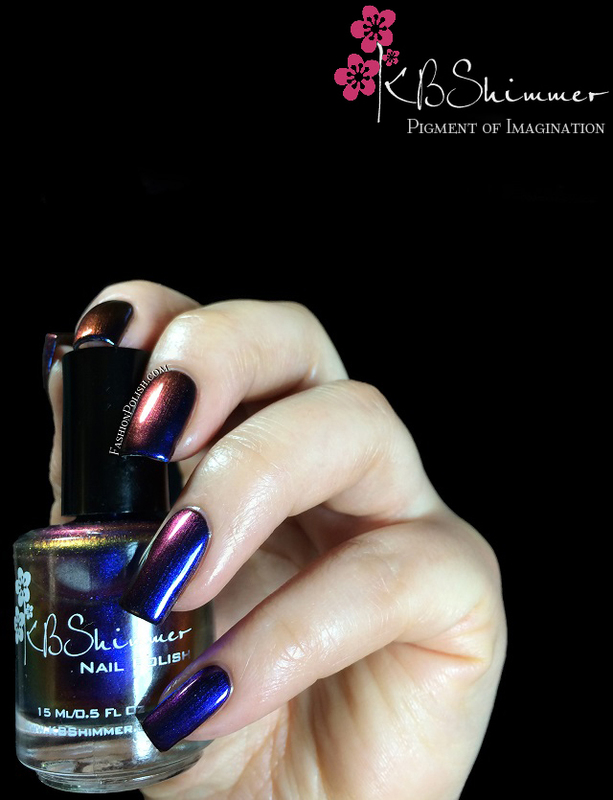 "This multi-chrome polish shifts depending on the angle and the light, from blue, to purple, to red, and more"
Super strong multichrome shift, I can see at least 4 colors on this one! 1 coat over black and POW! 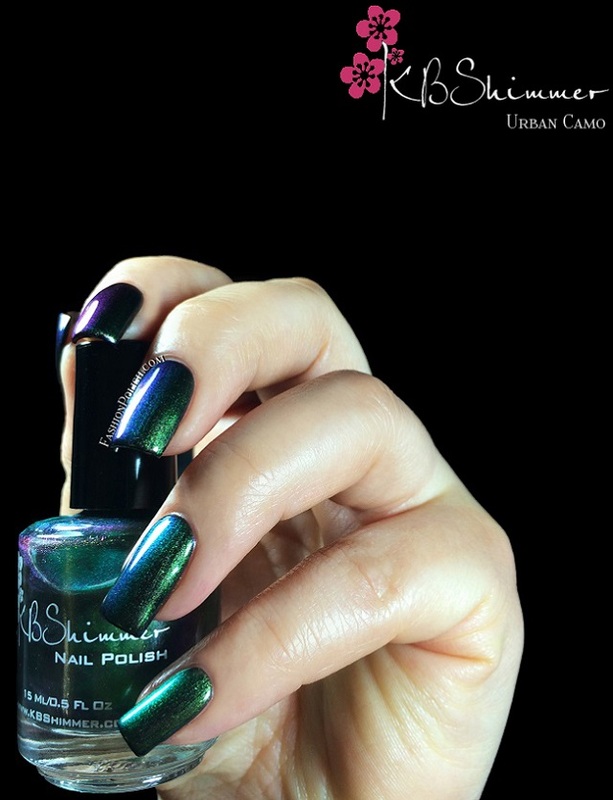 "Similar in shift to Pigment of Imagination, this multi-chrome also has a linear holo!" I've tried a lot of duochrome/holo combos but I think this one probably has the strongest flame! Seriously awesome! The holo tends to "lighten up" the base color but it's as obvious in real life as it looks here. Again, this is 1 coat over black. "A multi-chrome polish that changes depending on light and angle from cyan, to blue, to red orange, to purple, and more"
I mostly see the cyan / blurple / warm purple shift here but it's still super gorgeous. Coats used : 1 over black. "Similar in shift to Shade Shifter, this multi-chrome also has a linear holo!" Another stunner! Strong rainbow and duochrome, amazing over black! This one also looks lighter due to the silver holographic particles The swatch below shows 1 coat over black. "A multi-chrome polish that shifts from a pretty pistachio green, to a bright green, to silver, to a soft pink almost lavender color depending on the light and viewing angle"
Another strong multichrome, for the green lovers! Again, 1 coat over black in the watch below. "Similar in shift to Urban Camo, this multi-chrome also has a linear holo!" Lighter base color same color shift and strong linear flame, again, 1 coat over black. "A deep blue polish is filled with shimmering flakes"
Blue glass flecked shimmer with a subtle color shift in the bottle than only translates on the nails under extreme angles, it's still an absolutely gorgeous color. I used 2 coats, first thin and second slightly thicker, it's a 2 to 3 coater. Have you tried any of these? What's your opinion on the duochrome/holographic combo?